Of the two species of the genus Tanaecia found in Singapore, the Malay Viscount is by far the commoner. It is a forest dependent species and is usually found in the safety of the forested areas in Singapore's nature reserves. It prefers to forage on the forest floor for overripe fruits and can frequently be observed at the ripened fruits of the Singapore Rhododendron, on which it feeds greedily. Did you know that Viscount is pronounced as (vaɪkaʊnt), where the "s" is silent? There are still some people whom I've heard pronouncing the name incorrectly. 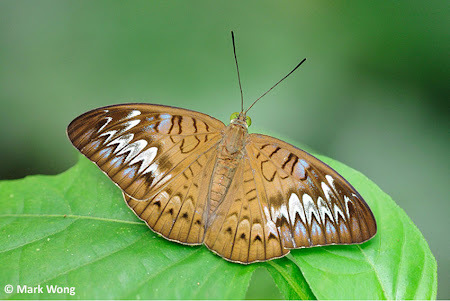 The Malay Viscount may sometimes be confused with the female Malay Baron or the female Horsfield's Baron when in flight. Only a closer look and checking on the diagnostic features of the markings can one ID it correctly. This individual was photographed last weekend by ButterflyCircle member Mark Wong at the Dairy Farm Nature Park.